Ever wondered what it’s like to get married in the wedding capitol of the world? Then my little blog post should hopefully shed some light on our awesome experience for you. If this is the first time that you have been on everthewanderer.com – firstly welcome and thank you so much for taking the time to explore my page. Let me give you a little background on how Phil (my now husband, I still love saying that!) and I decided to elope. Phil and I have been together for 12 years, we met at University and instantly had a mutual intense love for travelling the world. We have lived and worked in New Zealand, Australia and Canada as well as travelled to many other countries. When Phil proposed, whilst we were snorkelling on a trip in New Caledonia we couldn’t wait to plan our wedding. Low and behold 6 months later we got married…in Las Vegas. Now this was not my first choice of venue – I wanted to get married in the UK in a very traditional way and was swept away with the romanticism that came along with planning a big white wedding. The problems with this idea – we were living in New Zealand so really far from home and a lack of expendable money! One day Phil said that we should get hitched in Vegas (I thought that he was joking) so didn’t think much of it! I didn’t really want to get married in a tacky chapel with Elvis singing “Viva Las Vegas”. But the idea did grew on me the more I researched and realised that A) It was amazing value and B) You can get gorgeous wedding packages with phenomenal photography. After hours of looking for advice on wedding blogs and scrolling through numerous wedding photography websites we finally found a company that was able to create an elopement package that our dreams were made of. Cactus Collective Weddings create elopement packages to suit many budgets and offer the photography quality that we were after (just look at our photos ) You can easily get married in Las Vegas for $200 including photo’s with other companies, but if quality is what you are wanting then I wouldn’t opt for this. So after making our deposit and setting a date we planned the remainder of our trip. We decided that we would elope with just the two of us, no family or friends in May of 2017, when the weather in the desert is just right and not too hot. 6 months after getting engaged we flew to Los Angeles where we embarked on a Californian Road Trip of a lifetime. Getting married was to be the finale to our trip and it was seriously worth the wait. On our wedding day we woke up from our Suite in Caesars Palace (which we got a complementary upgrade to – more on how to do this in the Las Vegas blog post coming soon) and walked over to The Bellagio where we hired a black convertible Ford Mustang for the day. After driving back to the Caesars Palace valet with the roof down (honestly felt like we were in some Hollywood Movie doing this) we made our way down to the pool, and these pools are insane! I can honestly say that never in a million years did I imagine that on my wedding day I would be lying on a plush sun lounger by the pool at Caesars Palace, listening to sweet DJ music and drinking Margaritas before midday (my all time favourite cocktail) We swam, ate lunch and bathed in the Nevada desert sun before making our way to our room to get dolled up for our sunset ceremony. If you were ever curious to what it might feel like to be famous then all you need to do is wear a wedding dress and walk arm in arm with your other half through the hotels of the Las Vegas strip. The amount of kind well wishes and compliments we received was so heart warming. Of course on your wedding day something has to go wrong. Our sat nav did not entirely know the destination of our ceremony- possibly had something to do with the fact that we were having it in the middle of the desert about a 40 minute drive out of the city. Luckily road signs still exist and we made it to the venue, albeit only 20 minutes late. One of the amazing things about booking an elopement package is that pretty much everything is done for you. All we needed to do was pick up our Marriage Licence (which is super easy to do) the day before and bring this with us. When we arrived at our chosen venue – Nelson Ghost Town, we were greeted by our photographer and minister who had our floral arrangements. After receiving a talk on the dangers of the cactus plant and signing a waiver we made our way to our “alter” to say our vows. This was a wooden archway with stain glass overlooking a Cholla Cactus garden at sunset in front of a stunning red rock canyon. Within 10 minutes of arriving we were saying our vows to each other. Bonnie, our minister had asked us to complete a questionnaire on our relationship prior to coming and this enabled her to create the most personal and passionate service, we were so moved by her words. It felt like she had known us for years. As the sun set and the ceremony came to an end we had 2 hours of photography to celebrate becoming Mr and Mrs. Nelson Ghost Town sits in Eldorado Canyon and is a deserted gold mine. Host for many photo shoots this truly unique location is home to many old vintage cars, barns and trinkets. Exploring the site was so much fun and we ended up with some breath taking photos. Once the shoot was done we rolled down the roof on our convertible and drove back to the city with the bright lights of the strip leading the way. 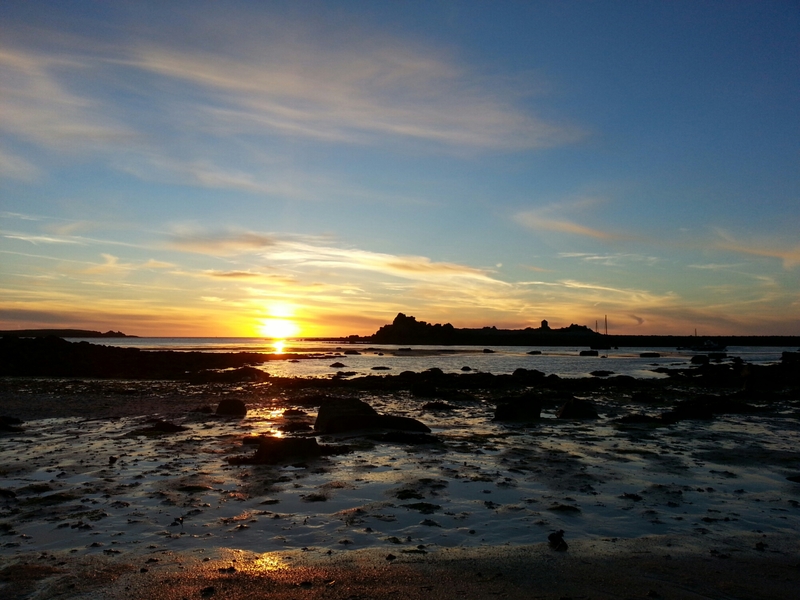 Sunset on St Agnes, Isles of Scilly a few nights ago. Simply stunning! Things have been busy here at Ever The Wanderer camp, we are getting geared up for our next trip to my number one destination on my Top 5 Travel Destinations list, and I am currently training to be an International Travel Consultant. All very exciting. So here is a photo from our California Archive in February earlier this year to keep your appetite wet. 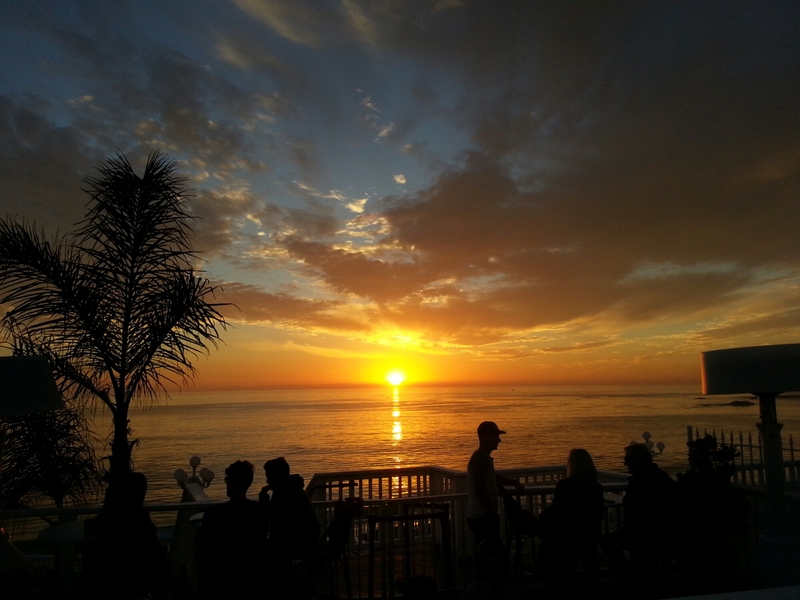 Laguna at sunset, cant beat this view!